These small laundry room tips for organization will give everything its place and give you the chance to actually get the laundry done. If you struggle with a tiny space to do your wash, these organizing tips will change your routine! 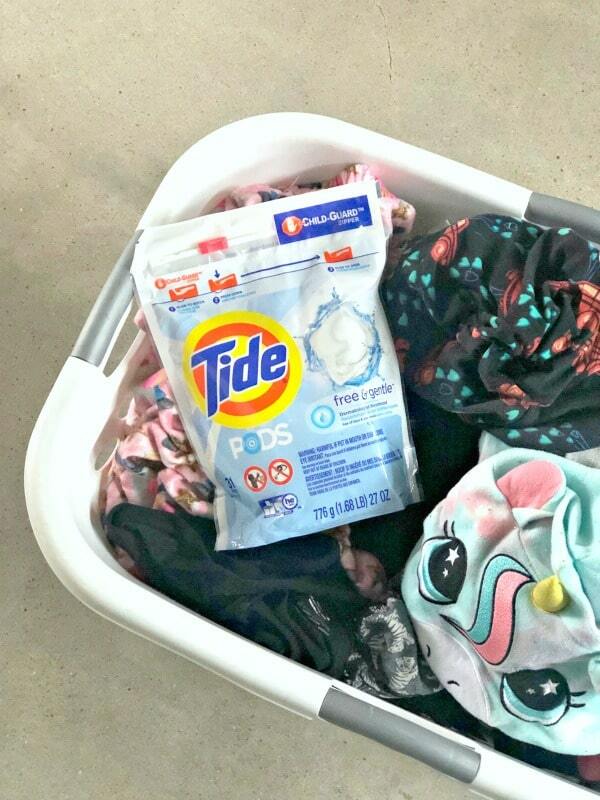 This is a partnered post with Tide. Four years ago next month, we moved into our current house. Overall it’s bigger than our last house, but some areas of the house are smaller. Like the laundry room. Our last laundry room wasn’t the biggest either. Not by any stretch. It was right off the garage, so there was a door to go there and a door into the main living area. But there was actually room to turn around and just open the doors of the machines fully. You could even set up a pack n’ play in there (but don’t ask me how I know that). And that’s when I became a pro at organizing small spaces. We have to separate our bulldogs when they eat, so one of them actually eats in the laundry room. We have such a small laundry room that he has a hard time turning around and has to back out. You can trust me when I say I know the pains of having a small laundry room. Since we’ve lived here I’ve been forced to come up with small laundry room tips for organization. Otherwise, the laundry would never get done. So when you have a small laundry room, you need to make sure you use all of the space you have. 1. Make use of all of the space you have. If you have a small laundry room, you need to make sure you take advantage of whatever space you do have. While I don’t have a lot of square footage in my laundry, I do have high ceilings. If your machines are side by side, you could add shelving above your machines or even stack your machines to create more floor space for other storage options. You may also find you have extras space between your machines or against one wall. The extra space in my laundry room is small and closest to the door, but I am able to put my Swiffer and mop there. When we bought our washer and dryer, we decided to get the laundry pedestals too. This gives us a ton more storage under each machine. And since it’s hidden, there’s a lot of things I can stash down there out of sight. You can also add storage containers to the tops of your machines. Whether you go with baskets or making your own storage containers, just make sure that it keeps all of your supplies together and looks good too! 3. Use products that do multiple jobs or ones that don’t take up a lot of space. Since space is at a premium, you don’t want tons of laundry products cluttering your space. Instead, find products that do double duty. 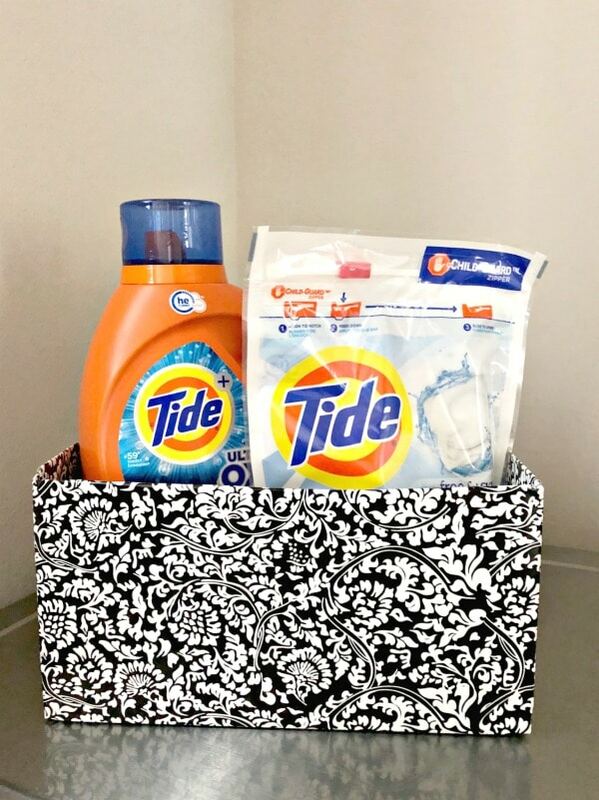 Tide offers liquid detergents and PODS that give you the clean you want from the detergent plus added benefits like Oxi Power or fabric softener. If you don’t have room for large bottles, go for the PODS since they take up less space. 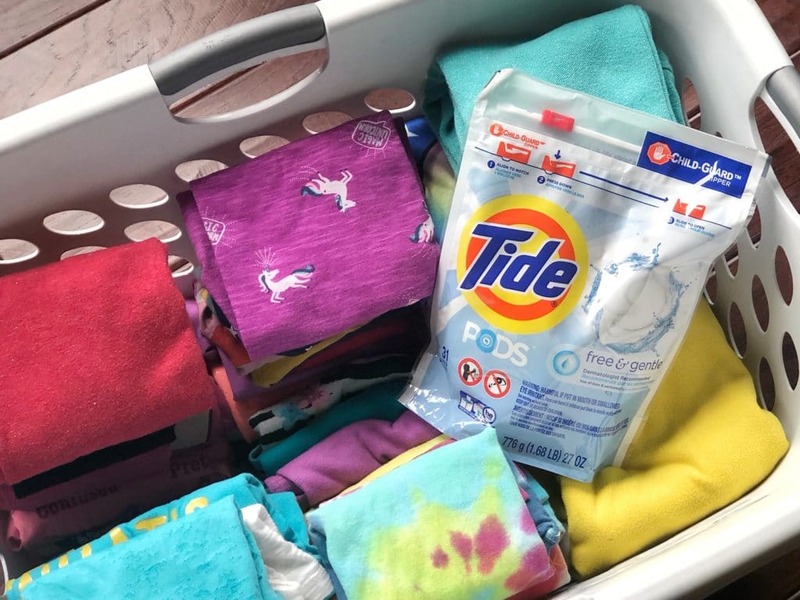 They’re also great to take with you when you’re traveling so you can get a load of laundry done on the go. Having your own detergent is especially important if you have sensitive skin. Right now you can stock up and save on your favorite Tide products when you print these two coupons! You can get a $3 Tide PODS coupon AND a $3 Tide Detergent coupon that you can use at any retailer, nationwide from 1/25-2/2. Do you have any other small laundry room tips for organization? Share them with me on Facebook!